GoPro fans and the financial world have been looking forward to GoPro’s new Karma since GoPro announced last December that it was working on building its first drone. When they delayed the release from early summer until now, it only served to raise expectations. 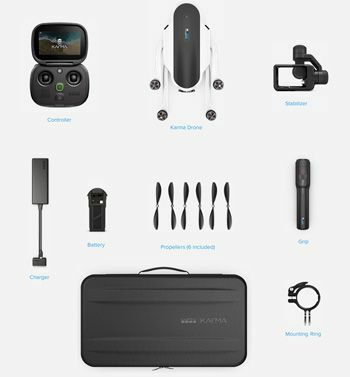 Update: DJI, the Chinese drone maker, responded to GoPro’s Karma launch with a new small, totable, full-featured camera drone which they call Mavic Pro. In a grand gesture for their launch, GoPro took over the Squaw Valley ski resort near Lake Tahoe for their presentation. GoPro’s founder and CEO, Nicholas Woodman, introduced the Karma and also a new line of HERO5 cameras to hundreds of international press at the event. For existing GoPro users looking to purchase their first drone, the Karma provides “an awesome out-of-the-box experience.” Flip out the foldable propeller arms and landing gear and it’s ready to fly. The Karma is solidly constructed, slickly styled, and rugged (plus all the parts are replaceable). The Karma consists of multiple components in addition to the flying unit. A detachable three-axis gimbal system keeps the camera steady and its position at the front enables the capture of wide-angle video without the propellers in the picture. Unlike the gimbals in other drones, the Karma Stabilizer can be removed and used for handheld shots, using another attachment accessory called the Karma Grip. The battery-powered Grip has controls for turning on/off the Stabilizer and the recorder, and tagging clips during recording. Karma’s controller, which includes its own screen rather than relying on a smartphone or tablet, along with GoPro’s control software, is quite intuitive. Karma folds down neatly into an included backpack — making it fully portable and very professional. When shooting video, the Karma Controller has an Auto Shot Paths feature, one of many presets included in the kit. These presets let you create smooth, professional-looking shots. For example, in Cable Cam mode, Karma travels back and forth along a line; the user just needs to set points A and B. This long-anticipated launch, expected by many in the financial community to add an important new competitor in the drone-making market, does add a formidable and deep-pocketed player. The commercial drone industry is consolidating with service providers private-labeling Chinese drones and reselling them with their value-adding sensors, speciality cameras and custom software. GoPro’s new Karma consolidates and packages their years of experience in action photography into a very capable and professional system competitively priced at $799. Just add a camera/video. Karma’s begin shipping October 23rd.